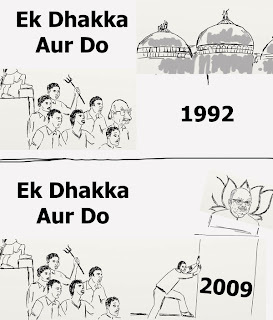 "With the 'half-pantiyas' teetering on the brink, it's now our turn to say, 'Ek dhakka aur do'... http://bit.ly/hCqBy"
The reference to 'dhakka', of course, was the BJP's use of the word in the run up to the demolition of the Babri Masjid in 1992. Well, the line went around and now the The Comic Project has turned my words into deeds, updated in the context of the ongoing crisis within the sangh parivar. Thank you!